The first comprehensive guide to Japanese chess in English for complete beginner and advanced (dan) player. An account of professional shogi in Japan (20 million Japanese can play!). In-depth guide to strategy and openings (plus handicap games). 108 annotated professional game references, including the first 8 title games outside Japan. 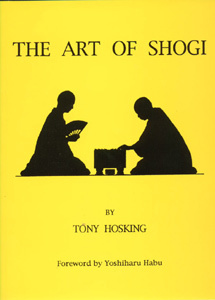 Comparison and brief history of shogi and Western chess - which share the objective of checkmate, and some similar movement of pieces (kings, rooks, bishops, knights, pawns). Captured shogi pieces change sides and can re-enter play, making nearly every game exciting and decisive!